The aboriginal people of Australia have long used tea tree oil. 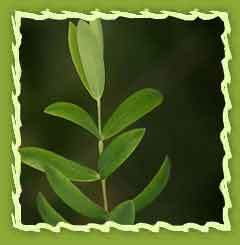 Similarly tea tree has a long history of use within the field of aromatherapy. In World War Two, the producers and the cutters of tea tree were exempt from military service until enough essential oil had been accumulated. The oil was a highly valued product as it was issued to each soldier and sailor as part of their kit in order to treat tropical infections and infected wounds. The Tea tree is a small tree or shrub with needle-like leaves. It is also domestically referred to as Ti-tree. It can grow up to 7 meters (20 feet) in height and thrives in marshy areas, though it is now cultivated in plantations. The tea tree is very robust. It is ready for cutting only two years after its previous harvest. Tea tree oil is a yellowish green-tinged essential oil with afresh camphoraceous odour. The light yellow tea tree oil is produced by steaming the pine-needle-like tea tree leaves to force out the oil which is used mainly in medicine, but also for industrial lubricants and cosmetic products. The oil has a nutmeg-like smell. Tea tree oil contains chemicals known as terpenoids which are believed to provide the oil its medicinal properties. Australian standards were established for the amount of one particular compound, terpinen-4-ol, which must make up at least 30% and preferably 40-50% of the oil for it can be considered medically useful. Chemical constituents: Tea tree oil has various chemical compounds that include Terpinen-4-ol, Alpha-Terpineol, Cineole, Pinene, Alpha Terpenene, Beta-Caryophyllene. Extraction: The tea tree oil is extracted by the steam distillation of leaves. This is the greatest oil to fight viruses, bacteria and fungi. Wounds and scrapes can be washed out with a mixture to disinfect the area. It clears up wounds and is useful with acne, dandruff and head lice. It furthermore helps to soothe sore muscles and generally fortifies the body. It has antimicrobial, antiseptic, bactericide, cicatrisant, expectorant, fungicide, insecticide, stimulant and sudorific properties. Tea Tree essential oil is best known as a very powerful immune stimulant. It can help to fight all three categories of infectious organisms (Bacteria, Fungi, and Viruses) and there is evidence that tea tree oil massage prior to an operation may help to fortify the body and reduce post-operative shock. It is used in vapor therapy and can help with colds, measles, sinusitis and viral infections. Tea tree oil has been used for skin and hair and to combat acne, oily skin, head lice and dandruff. Tea tree oil when added to a hot bath help in relaxing the muscles. It also helps in minor cuts and bruises. It is helpful incase of burns if applied immediately by washing area with ice water, then applying drops of tea tree oil to burned area helps to produce soothing and healing effect to the skin. It is helpful in case of calluses and corns. Tea tree oil is being used in number of applications like all purpose cleaner, deoderizer, bedsores, dishwashers, humidifiers, plant sprays, vaporisers etc. Tea tree has a marked oil dissolving and dispersing action, which can help alleviate overly oily secretions of the skin. One way to take advantage of tea tree's natural astringent action is to dilute 12 drops of the oil in about three ounces of warm water and gently wipe freshly cleaned skin with the mixture using a soft cotton ball. An oily scalp can also benefit from an application of tea tree oil. Before shampooing, a gentle massage with a few drops of the oil will gently invigorate the scalp and help lift greasy deposits from the hair shaft. It act as a very good hair conditioner. Because of the mild qualities of tea tree's terpinen content, the oil can soothe cuts, scratches, sunburn and cold sores. Because it's non-irritating, a single drop of the oil can be applied directly to minor injuries once or twice a day. Tea tree oil is used for many household cleaning purposes. Deodorisers :It includes the use of deodorisers for misting the room with the application of tea tree oil. Humidifier : The addition of drops of tea tree oil in to the humidifier help in cleaning and refreshing the air. Plant Spray : The addition of drops of tea tree oil to in a bottle of water, alongwith drops of hydrogen peroxide helps in misting plants with spray bottle. Vaporizer : The tea tree oil mixture with water helps to alleviate stuffiness, allergies, headaches and flu symptoms. Washing Machine : : The addition of drops of tea tree oil to each load of laundry will disinfect and leave laundry smelling clean and fresh. Tea tree oil : : may also be used to treat oral bacteria that cause cavities, gum disease, and halitosis. Commercially tea tree oil is considered an effective addition to antiseptic oral rinses and toothpastes.